In 1950, the late Missionary Lula M. Davis, a member of the Temple Church Of God In Christ who was at that time pastored by the late Bishop Charles Harrison Mason, was led of the Lord to begin a non-denominational Bible Band. This Bible Band met under a tree at the home of Mose and Ida Sutton. It was through the Bible Band teachings of Missionary Davis that the Lord saved Mr. and Mrs. Sutton, the late Mother Cora Tillman and many others. As the Lord poured out His Spirit in the Bible Band, the membership began to grow. The Apostle Paul asked, How then shall they believe of whom they have not heard? And how shall they hear without a preacher? (Rom. 10:14b-c) On this wise, Missionary Davis called the late Bishop A. B. McEwen, Sr. and said "We need a preacher," and in 1951, Bishop McEwen sent Elder C. C. Carlock and the congregation was organized and relocated to 218 Tillman. The Lord then revealed to Missionary Davis in a vision that this newly organized ministry should be named Hebrew Church Of God In Christ. Upon sharing this revelation with Elder Carlock, he readily accepted this instruction from the Lord as given to Missionary Davis. Because the Lord continued to tremendously bless this ministry through the saving of souls and the adding of souls to the congregation, it became necessary for Hebrew to relocate. The congregation moved to a storefront at 562 Scott Street where the power and anointing of the Lord continued to be manifested; the sick were healed, the lame walked, the eyes of the blind were opened and the dead raised. Those who received their healing donated walking canes, crutches, wheel chairs and other artifacts to the church as a testimony of the Lord’s miraculous healing powers. 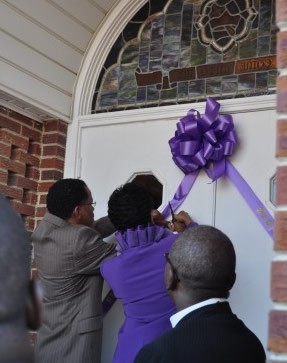 Souls were continually being added to the church and in 1958, having outgrown the storefront, the congregation moved to a small church on Princeton Avenue and Scott Street. The Lord was not finished blessing the Hebrew ministry. More souls were added and yet another move was necessary. On March 9, 1962, after having purchased property on which to build, Elder C. C. Carlock and the members of the Hebrew Church Of God In Christ marched from Princeton Avenue and Scott Street to their new church home located at 982 Meagher Street. Superintendent Carlock successfully pastored the congregation for forty years. On Saturday, December 21, 1991 the Lord called Dr. C. C. Carlock from labor to reward. On Sunday, January 5, 1992 Bishop Samuel Lowe, prelate for Tennessee Fifth Jurisdiction, appointed Elder Dickerson L. S. Wells pastor of the Hebrew Church Of God In Christ. At the time of his appointment of Hebrew, Elder Wells was also pastoring the Bethesda Church Of God In Christ. The Bethesda Church, 37 years the junior of the Hebrew Church had its genesis on this wise. In 1987, the Spirit of God moved upon Elder Dickerson Wells to organize a church. After much prayer and consecration was given to this directive, in January of 1988, Elder Wells made public the Lord’s plan for him. Sunday, February 7, 1988 marked the first service for the Bethesda Church. On Wednesday, April 6, 1988, during the Workers’ Meeting of Headquarters Jurisdiction, Elder Wells received his Pastorial appointment to the Bethesda Church at the hand of the late Presiding Bishop of the Church Of God In Christ, Bishop J. O. Patterson, Sr.
Just as the Lord had blessed the Hebrew Church, He likewise poured out His Spirit on and added souls to the Bethesda Church. After his pastorial appointment to the Hebrew Church, Pastor Wells immediately asked both congregations to join him in a Prayer Revival to ask God to heal the broken hearts and to give His direction for the congregations. At the close of the two-week revival, Elder Wells successfully merged both congregations and from that time the Lord has set His approval on this ministry. 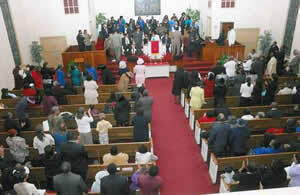 Since 1992, the congregation has been shepherded by Elder Dickerson L. S. Wells under the auspices of the Holy Ghost. In 1998, Pastor Wells led the congregation in the purchase of their edifice located at 2216 Clifton (Whitney) Avenue, in the Frayser community of Memphis. The 8 acres house a sanctuary with a seating capacity of 600+, chapel, fellowship hall, 20 classrooms, office complex, Day Care Center, baseball diamond, football field, and much more. The Lord has also broadened the ministries of the Hebrew Church. Hebrew now has over 40 active ministries which include Boy Scouts, Food Pantry, Clothes Closet, Adopters to Grandview Heights Elementary School, Tutoring Program for grades K-12, Cheerleaders, Prison and Nursing Home ministries, Scholarship Fund and so much more. "TO GOD BE THE GLORY!" In the year 2005, the Lord spoke to Pastor Wells and instructed him to regarding given a name to this ministry which was more reflective of the beliefs and principles of this ministry. Through His Word, as found in Genesis 28:12-17, the Lord revealed unto Pastor Wells that this ministry is and shall be known as the House of God and so was birthed the Bethel Church Of God In Christ. In January 2011, the Lord spoke to Pastor Wells from Isaiah 54:2, "Enlarge the place of thy tent, and let them stretch forth the curtains of thine habitations: spare not, lengthen thy cords, and strengthen thy stakes." 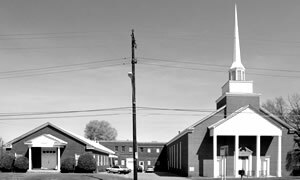 By October 2011, the Lord had blessed the ministery to acquire property in Munford, Tennessee and Bethel became "one church ministering in two locations." The Lord has continued to add laborers to this new portion of the vineyard and wonderful things are happening at Bethel's Munford campus.